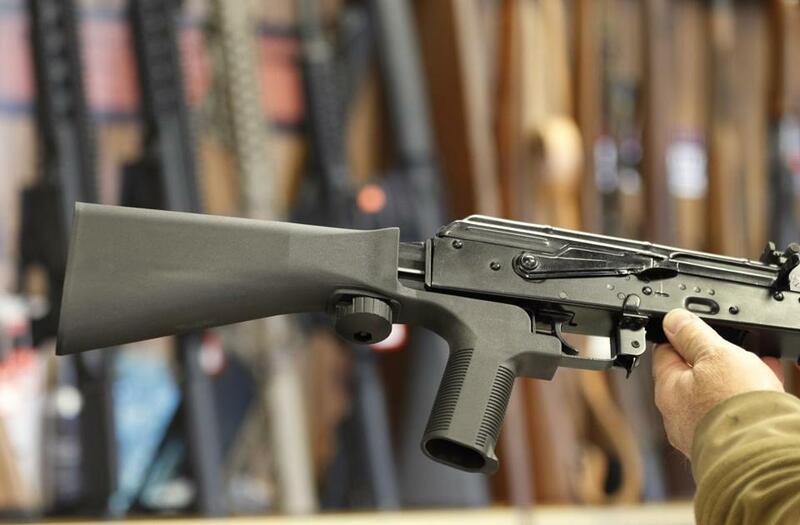 A bump stock device installed on a semiautomatic weapon is shown in a gun store in Salt Lake City, Utah. Massachusetts lawmakers could move swiftly to ban bump stocks, the devices found in the Las Vegas gunman’s room that allow semiautomatic rifles to fire as if they were automatic. Both Democratic and Republican lawmakers are proposing legislation, and leaders of the Democratic-dominated House and Senate support taking action. Republican Governor Charlie Baker said he backed outlawing the devices . The resolve from state officials comes amid signs that the shocking carnage in Las Vegas, where at least 58 people were massacred and hundreds more were injured, could spur gun regulation action at the federal level. Legislation cracking down on bump stocks has also been introduced by lawmakers in a number of states this past week, including New York, Wisconsin, Illinois, and New Jersey, according to reports. In Massachusetts, House Speaker Robert DeLeo “believes bump stocks should be illegal, and the House will move quickly on the issue,” DeLeo’s office said Thursday in a statement. Pete Wilson, a spokesman for Senate President Stan Rosenberg, said Friday that Rosenberg also supports a ban. “We’re poised to act as quickly as possible. It seems like we’re all in agreement that something needs to be done,” Wilson said. “We want to outlaw these devices and prevent anyone from trying to circumvent the automatic weapons laws of our state,” Senate minority leader Bruce Tarr said in a statement. The Republican bill makes using a device to cause the rapid fire of a weapon illegal. It would subject an offender to the potential of life in prison. State Representative David Linsky, a Natick Democrat who played a role in crafting the state’s 2014 gun violence prevention bill, filed legislation Wednesday that would ban bump stocks. The Gun Owners Action League, the Massachusetts affiliate of the National Rifle Association, does not have a position on bump stocks, State House News reported. John Rosenthal, co-founder of Stop Handgun Violence, said he expected Massachusetts would pass legislation. “Any restrictions on aftermarket accessories that can be purchased over the Internet without detection to make semiautomatic weapons automatic weapons is a positive step,” he said. He said Massachusetts, which is known for its strict gun regulations and has an assault weapons ban, had seen gun deaths decline in the past two decades because of its laws. “We have proven that gun laws save lives,” he said. But he also said that more needs to be done, including the banning of the .223-caliber bullet, which can inflict devastating damage to the body. He also praised Attorney General Maura Healey’s efforts to prevent weapons that, with legal modifications, can mimic assault weapons from being sold in the state. Individual state bump stock bans would not be as effective as a national ban, said Andrew Patrick, media director at the Washington, D.C.-based Coalition to Stop Gun Violence, because people can bring guns from one state, where there is no ban, into another state where there is one. Federal authorities have said 12 bump stocks were found in the Mandalay Bay Resort and Casino room that Stephen Paddock used as a sniper’s nest to fire into a crowd attending a country music festival. The devastating effects of automatic weapons fire have been known on the battlefield for more than 100 years. Jeremiah Manion of the Globe staff contributed to this report. Martin Finucane can be reached at Martin.Finucane@globe.com.